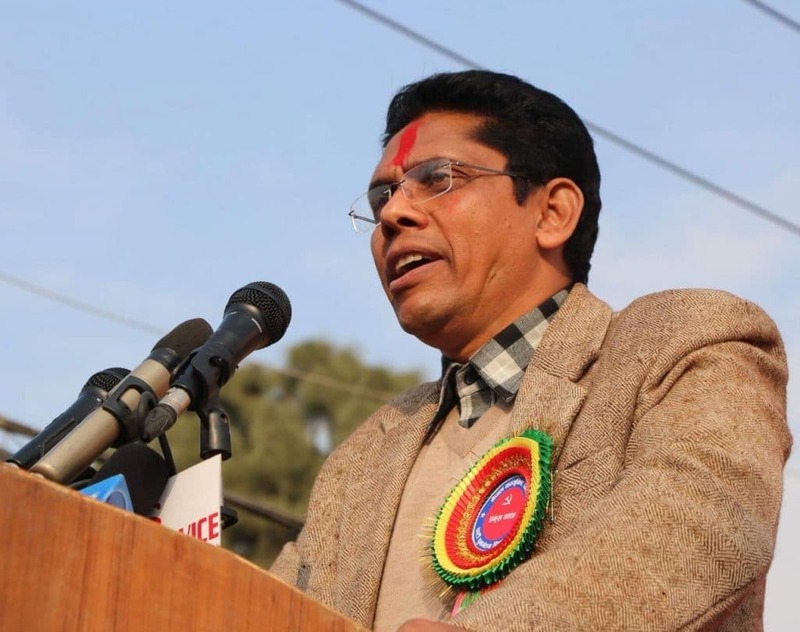 In Nepal, where I am currently traveling to learn from its Left movements, nothing could better exemplify this kind of spiritually-rich social base than that of the communist movement led by Netra Bikram Chand (“Biplav”). Militants of this movement, which consolidated itself as a party some five years ago, wear their commitments on their sleeve. In that sense they have a great deal in common with Chavismo in its best moment. Just as we used to defy the world saying “Uh ah, Chávez no se va,” they do the same affirming “Communism will win!” and just like us in the beginning, they cannot get enough of the color red. Militants even use red pens, while at important events and rallies they replace Hindu tikas(forehead marks of colored powder) with giant red “communist” swaths on their leaders’ brows. Another powerful idea that Biplav projects–perhaps it is the most powerful revolutionary myth of all time–is that he and his party are on the move, insurgent against power. The party has declared its vocation to seize state power (even if they admit that the time may not be now), meaning that both militants and masses know that the die is cast, and sooner or later everyone will have to decide if they are part of the rising tide. This is also what drew people to Chávez. The attraction was based not solely on a rational assessment of Chávez’s ideas, but also on the belief that those ideas could and would become a reality. Call it a revolutionary wager. For those of us who sensed it, it was both a challenge and an invitation. Last week, I went to a major rally that Biplav’s party organized in Kathmandu. It lasted the whole day. 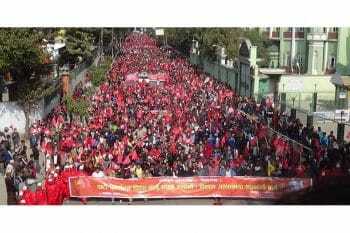 From about 10 am on, waves and waves of red marchers began to fill a long street to the east of the city’s centrally-located Ratna park. The high spirits of the marchers–who were giving vivas to scientific socialism–contrasted sharply with the boredom of the black-clad riot police lulling on the margins with their lathis and guns. By midday, the street seemed full to bursting with scarlet marchers. Then, after a brief pause, twice as many more arrived and in even higher spirits. In truth, the whole event felt electric, and the militants’ enthusiasm was highly contagious. 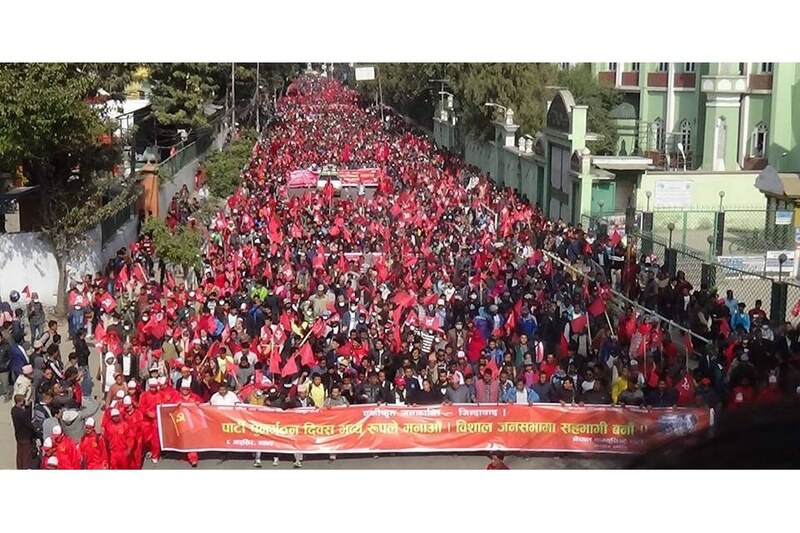 Massive rally of the Biplav-led Communist Party of Nepal. Marchers in a rally of the Biplav-led Communist Party of Nepal. Photo credit: Chris Gilbert. The main spokesperson for the Biplav-led Communist Party of Nepal, Prakanda, speaking at a rally. The above is a radically abbreviated summary of a meeting that went on for over an hour. It was an encounter that moved me profoundly. But more than the contents of Prakanda’s presentation, what won me over was his total conviction and generous desire to see me and all others take part in the movement and contribute to developing its program. Throughout the meeting with this cadre–whose role as spokesperson has landed him repeatedly in prison this year–I felt that the quality of the relationship and an ethics of communist fraternity was always in the forefront. Is this search a good idea? From what I have seen in Nepal, I am inclined to be skeptical. I am now led to believe that once a movement such as Chavismo begins such a search, it has already strayed very far from the path. That’s because Nepal’s Biplav tendency demonstrates how an ethical spirit that permeates everything–and is not merely based on a moral referent–is really the sine qua non for a meaningful revolutionary movement. 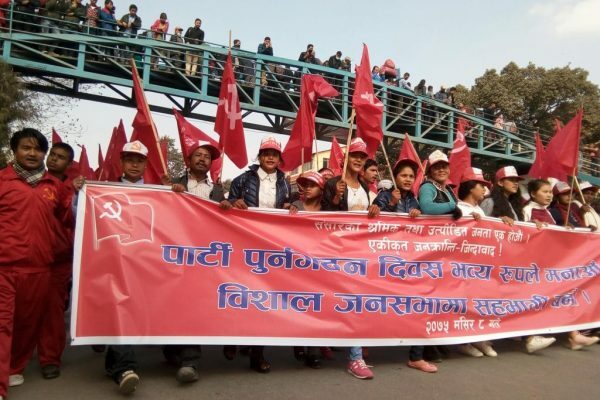 It is this spirit, reaching far beyond mere ideology and program, that is the defining mark of the movement that, in my view, most plausibly fights for communism in today’s Nepal.